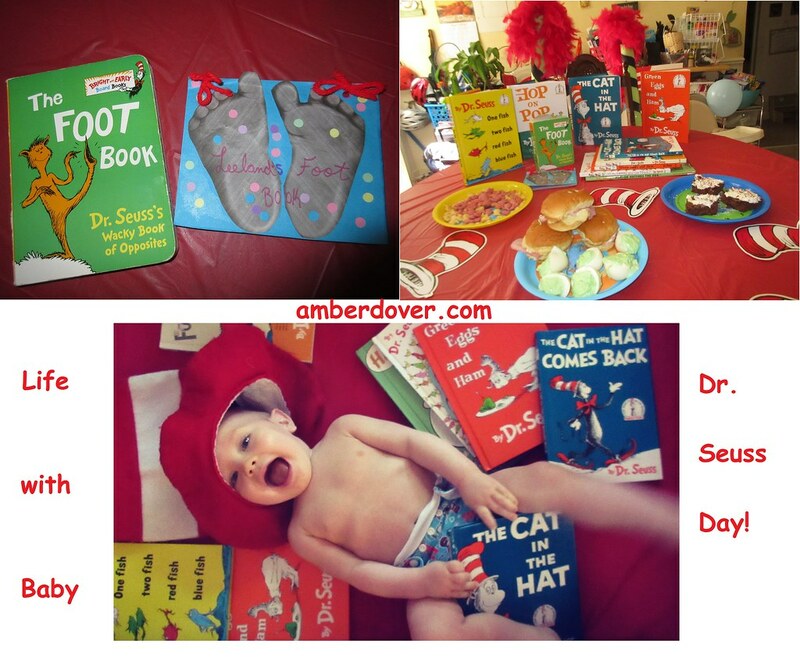 In this post: Our own Seuss inspired foot book, Seuss treats and stories, and a baby Seuss photo shoot. Also, Michael’s Seuss-like poem. Come join us! Seuss-inspired Foot Book~ The Foot Book was Leeland’s first Dr. Seuss book. I love baby foot prints and wanted to incorporate that into our Seussical celebrations. Hence, Leeland’s own foot book. I simply photo copied Leeland’s feet with our printer. It’s much easier than paint, and you get to see all the precious details. The first copy was the clearest, so I used it for the front of the book. I used the hole punch to make whimsical confetti. A little yarn finished it up. Here are a couple of sample pages. Seussical Brownie cakes~ Simply brownies topped with cream cheese frosting and sprinkles. The Truffula trees are from the above post as well. You’ll also find a Cat in the Hat photo poster and other Seuss decor. Michael took the Fox in Socks challenge. He read it as fast as he could without getting tongue tied. We broke out the Cat in the Hat “hat“, and Leeland had a baby Seuss photo shoot in his pack n’ play. Leeland is also wearing a Cat in the Hat cloth diaper. Michael colored these Dr. Seuss quotes. Lastly, Michael and I wrote this Seuss inspired poem.